It's okay am grudgingly starting to go back to it. The old miserable red faced fella has long gone. Was here for the first time in a while yesterday. It's still the best pub in Liverpool in my opinion. But they now have a more limited range of guest ales. Three ales are from the pub's brewery Flagship - Sublime, Silhouette & Yonder. Guests yesterday were Titanic First Class, Elland White Prussian, Big Bog WPA, Peerless Langdon Spin, Mobberley Elysium, Wantsum Grim Reaper & JW Lees Stout. Ciders were Hunt's Red Head & Venton's Skippy's Scrumpy. Was dragged back in as all the company wanted to come here. It hasn't changed at all regards décor or ale selection but it finally appears that the staff they now have actually want to do the job so I suppose it should be back on the map for me. For the first time this morning, I had the pleasure of trying the breakfast here. You get a decent sized plate for £6 and they're open from 9am. Whilst I had a coffee, I also managed a few ciders too. It was strange to see the place so quiet. But by the time we left around 11:30, it was starting to fill up a little. With few customers, service was good. Today's ale selection was Ship & Mitre Sublime, Level & Silhouette, Stamps Blond Moment & Rum Porter, Sandstone Sandstone Edge, Kendrick's Victoria, Martland Mill Lancashire Loom, Wychwood Hobgoblin, Nethergate Essex Border, JW Lee's Monnraker & Banks & Taylor Shefford Dark Mild. 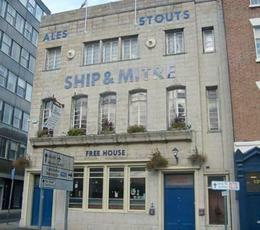 The one thing I really like about the Ship & Mitre is the fact there are different ciders every time I visit. All 3 on today were new ones for me - Waulkmill Crabbit & Cider Cyser & Rocquette Fauxguette Valley. 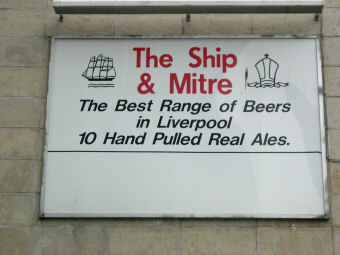 Still the best pub in Liverpool, in my opinion.